In 2013, hardware makers were successful at getting the word out that 4K would be "the next big thing in consumer electronics," and 2014 was predicted to be the year Ultra HD content finally followed suit. As it turns out, 4K isn't quite as ubiquitous as some might have had us believe almost 12 months ago, but there are encouraging signs such prophecies might really, truly come to pass in 2015. Journey with me now as I recap the highs and lows of "2014K" in an effort to get to the bottom of what went right, what went wrong and where things go from here. Sure, you could run out and buy a 4K TV right now for under a thousand bucks, but once you bring it home and set it up, what are you going to do with it? After all, those additional pixels aren't likely to make a lick of difference with your current cable or media streaming box. Netflix kicked things off in April by releasing the second season of House of Cards in 4K, although at the time streaming such content was limited to 2014 TV sets. Six months later, a $3 per month price increase for new 4K subscribers wound up killing what was left of the initial buzz. Samsung hedged its 4K bets with partner M-Go, which announced a catalog of 70 Ultra HD titles exclusive to the Korean giant's TV sets; unfortunately, the streaming provider sheepishly confessed that most of that content would be upscaled from HD for the time being. Not to be outdone, rival Amazon Instant Video launched its own 4K streaming for US customers in December - a full eight months after Netflix. Amazon's offering was, once again, limited to original programming and select content from Sony and the BBC. Recent troubles notwithstanding, Sony's Video Unlimited 4K service remained the reigning champ of Ultra HD content at the end of 2014, with more than 200 feature films and another 50 television series in its catalog, including a number of freebies. One of the biggest hurdles to widespread 4K streaming adoption (in the US, anyway) remains the meager broadband speeds required to push four times the number of HD pixels onto your shiny new 4K television. For example, Netflix and M-Go require roughly 15Mbps down to handle their respective H.265-encoded streams; many US households still have trouble just achieving consistent data rates for 1080p and lower bitrates. A potential savior could arrive by the end of 2015 with the arrival of an as-yet unnamed 4K optical disc from the Blu-ray Disc Association, which feels an awfully long time away from where we are now. One solution to the lack of 4K content is to simply buy a camera and make your own: Earlier this year, Sony was once again one of the first out the gate with a prosumer-centric handheld camcorder capable of capturing video with 8.29 million pixels in the palm of your hand. Even action cam maker GoPro got into the act this fall with the diminutive Hero4 Black, capable of shooting 30-frame 4K video for under $500 (about £319, AU$612), an impressive feat rivaled only by Panasonic and its HX-A500 point-of-view wearable which can record Ultra HD for $100 less. Apple has sat out the 4K revolution thus far, although there are encouraging signs that could soon change, mostly thanks to this year's debut of the iMac with Retina 5K Display. The 5120 x 2880 resolution panel is capable of beaming a whopping 14.7 million pixels onto the screen, handily trumping even 4K. Last but not least, Apple's latest iPhone 6 and iPhone 6 Plus were found to have the secret ability to play 4K video content - a factoid Cupertino left off the spec sheets. That hasn't stopped third-party developers from taking advantage of the souped-up hardware anyway, with an app called Ultrakam 4K capable of shooting, editing and sharing videos in up to 3264 x 2448 pixels. 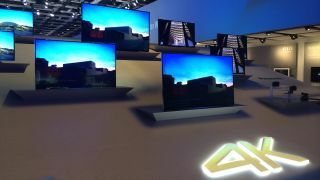 This time last year, curved 4K television sets from the likes of Samsung and LG were little more than a tantalizing CES 2014 tease, but in the months since, consumers can now walk into their local Best Buy and actually take one home. Of course, you'll pay for the privilege: Curved Ultra HD sets closed out the year with sale pricing in the $2,000 (about £1,276, AU$2,449) range for 55-inch displays, while Samsung's 78-inch model continues to take a dent out of the wallet at around $8,000 (about £5,106, AU$9,795) on sale. But there's still room to grow (literally! ), as the more lust-worthy 105-inch curved TVs fetch prices in excess of $100,000 (about £63,824, AU$122,442). However, if history is any indication, the cost of big-screen 4K televisions should drop accordingly over the next couple years, making them potentially affordable for mere mortals. Although 2014 may not have been the year 4K went mainstream, there's always next year (and the year after that, I presume); broadband speeds aside, there are a few other technological hurdles yet to be addressed. Provider DirecTV is paving the way to 4K, having launched a new satellite into orbit in early December that will eventually serve Ultra HD content to customers in the US and Puerto Rico. Live sports would also seem to be a prime candidate for 4K, although the BBC's Ultra HD trials during the World Cup last summer proved bitrates continue to be a roadblock, with 36Mbps currently required to pull down such a 2160p UHD resolution signal. With CES 2015 right around the corner, we're likely to hear even more promises on the future of 4K. Could they finally turn into realities in the New Year? I'll get back to you in about 12 months.